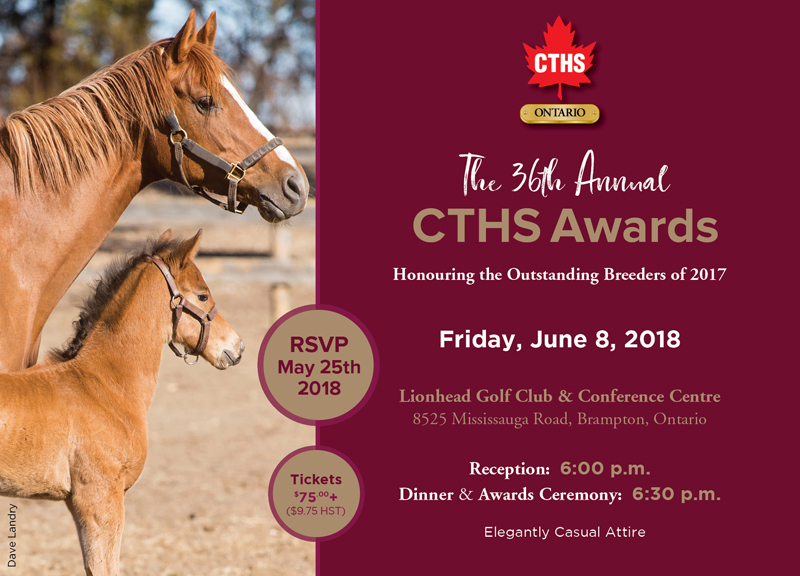 The 36th Annual CTHS Awards, honouring the outstanding breeders of 2017, takes place on Friday, June 8, 2018 at Lionhead Golf Club & Conference Centre in Brampton, Ontario. Each year, the CTHS is pleased to pay tribute to the breeders of Ontario-Bred Stakes winners and recognize the accomplishments of their Ontario Stallions. This year’s award winners include 66 Stakes winners of 2017 which includes 28 Graded & Canadian Classic Stakes winners. We will also be honouring the Anderson Farms (Ontario) Inc. as the 2017 Breeder of the Year recipient and Mrs. Elfriede Stronach as the 2017 Mint Julep Cup recipient. For further information and ticket requests contact the CTHS office at 416-675-3602 or email at cthsont@idirect.com. The event will also include a silent auction in support of the LongRun Thoroughbred Retirement Society. For directions to Lionhead Golf Club & Conference Centre, please visit here.